PESHAWAR: Senior politician and ANP general secretary Mian Iftikhar Hussain has once again received a ‘suicide attack’ threat and he says this time it is ‘serious’. He has received the warning about attempt on his life at a time when he himself and his party leaders and workers have announced to take to streets to protest alleged rigging in the elections and demand fair re-elections. “I am concerned as this time there was no mention of my name in any recent Nacta briefings, just like late Haroon Bilour, yet I have received this serious threat alert from all the civil and military authorities concerned. 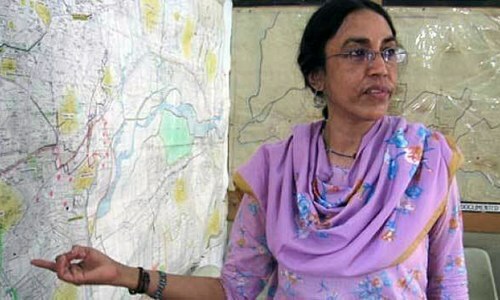 This is what worries me,” Mr Hussain told Dawn. “It has been learnt that militant commander Asif alias Kamran Haji, based in Kunar province of Afghanistan, has planned to target ANP leader Mian Iftikhar Hussain. It has been further learnt that a suicide bomber probably a woman/child has been arranged for the said purpose,” says the threat alert. The alert cautions to take extreme vigilance and suggests heightened security measures to avoid any untoward incident. “I feel as if this time I am not mentioned in any lists shared by the government. 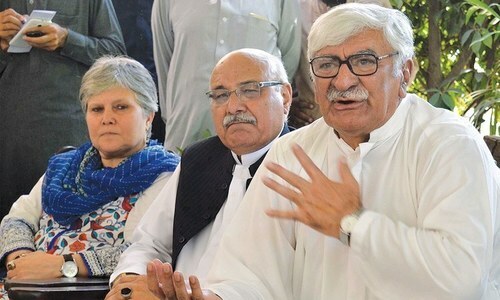 I think this time I am being presented as an easy target,” said the ANP leader, who seemed helpless with situation as his party that opposed militancy and approved a military operation against militants in the past, lost the elections badly. He alleged that it was done through rigging in which Election Commission of Pakistan, army and caretaker government were in collusion. Mr Hussain had been information minister in the ANP government in Khyber Pakhtunkhwa during a sensitive time when not only tribal areas but militancy infested Swat, Malakand and other parts of the province. Bomb blasts ravaged the streets, markets and political meetings between 2008 and 2013 and he being information minister was the first one to reach the scene of occurrence and console the victims’ families and threaten the terrorists of consequences and express the government’s resolve to eliminate them. Haroon Bilour, the ANP candidate for PK-78, was killed in a suicide attack on a corner meeting of the party on July 10. Mr Hussain despite such threats continued to take part in election campaign in his hometown Pabbi in Nowshera but lost the polls. 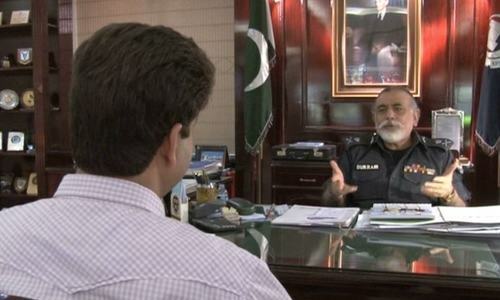 He said that he submitted an application for recounting of votes in the constituency but it was not accepted so far. He remained staunch and strong in the face of such threats even when he lost his only son Mian Rashid Hussain in his hometown in a terrorist attack in July 2010. During the last eight years or so, he whether in government or having lost elections in 2013 lived life amid such threats. Issuance of such terror alerts has become almost a tradition as before each religious festive occasion like Eid he would get a warning by local authorities to remain vigilant for his safety. Despite threats, Mr Hussian said, he decided like his party to openly go out and campaign as such threats kept them out of the election in 2013. He said that he was worried in the present situation as he along with other ANP leadership was made to lose the elections. He said that they were being silenced through such threats. “This is unjust that we were defeated through rigged elections and we also get such threats. I have no clue what to do about it,” said the ANP leader. He said that he would continue to raise his voice. Stop blaming the army Everytime. They are losing brave soldiers also. Attracting the attentions f the people after loosing the elections. Nice try. I'm seriously concerned about the security of the ANP leadership....and mian Iftikhar in particular....why is it so they have lost so many people in terrorism ....still they inspite of being in power, multiple times failed to catch the killers....and still face treats.....what actually is the story behind this story.